German cities, like most major European and world cities, are old and congested. Driving in these cities is generally more of a hassle than a necessity, especially with the excellent public transportation available. Still, there may be times when you want or need a car in town, or just got lost leaving the airport and ended-up in downtown Berlin, so here's some things to know and keep in mind regarding driving and parking in German cities. The central parts of most German towns and cities feature a lovely system of narrow, disjointed, and often one-way streets lined and clogged with cars. You may find yourself feeling like a rat trapped in a maze. A recent study determined that the average German spends 65 hours a year stuck in traffic or waiting at traffic lights. Having said that, I can say that driving in town, even "downtown", usually isn't too bad. 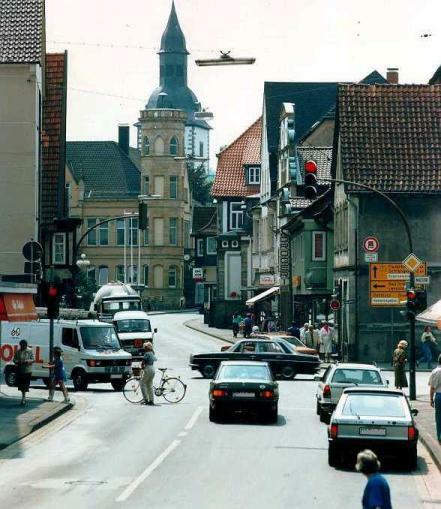 After the war, many German cities rebuilt their downtown districts and designed them to make automobile navigation a little easier. If you have experience driving in dense urban areas, you should manage fine in most German cities. Another piece of advice I would offer is this: park your car somewhere convenient and use public transportation to reach your final destination. This may save you a considerable amount of time, money, and cursing. You'll find many German cities have outlying park and ride (P+R Anlage) locations marked with "park & ride" signs for this purpose. 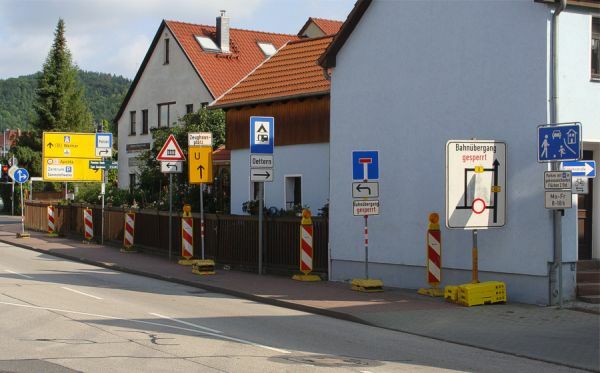 Many Germans describe their streetscape as a "sign forest" (Schilderwald) due to the abundance of traffic signs, so you'll need to pay extra special attention in areas with many signs so that you don't miss an important one. Be especially on lookout for for "do not enter" signs and "one way" signs -- miss one of these and you might become the new hood ornament on a delivery truck. Traffic signals are usually easy to see, but sometimes right-of-way signs may be difficult to spot. Also, look closely for parking or no parking signs before you park on the street to make sure that you may legally park there (more about this in the next section.) Especially watch for the many hidden driveways marked with obscure "Ausfahrt freihalten!" ("do not block the exit") signs or you may return to find that the police have performed their magic and made your car disappear. Some money will have to disappear from your wallet to make the car reappear. Another sign to watch for is the "bus lane" sign -- this sign marks a lane reserved for buses. You'll find these along some major boulevards in the larger cities. You may use this lane only if you're turning right, and you must not enter the lane until just before you make your turn. Taxis are allowed to use this lane as well when marked with a corresponding supplemental sign. Keep a sharp eye out for unmarked intersections, especially in residential areas, and yield the right-of-way to traffic approaching from the right. German motorists are rather "trigger-happy" when it comes to green lights. Many drivers are already entering the intersection when the signal turns green, so be prepared to go or expect some cranky honking from the guy behind you just mere microseconds after the green comes on. To avoid the one-way maze, use larger two-way avenues and boulevards to get as close to your destination as possible, then use the one-ways as needed to finish the job. If you get lost in the one-way rat trap, be warned that a couple of right turns could put you in France instead of back where you started. You would think that the Germans, with their collective obsessive/compulsive disorder, would have something as simple as house numbering organized to a fault. Instead, you often have to consume a couple of liters of beer before it makes any sense. Many places, fortunately, have the logical odd/even scheme. However, in some older places, houses are numbered up one side of the street then back down the other. When more houses were built along the same street, they repeated the process with the new houses. So on the four corners of a single intersection, you could have house numbers 20, 21, 40, and 110. With house numbering in disarray, it's no surprise that street names are as well. A street can change names anywhere it wants to (even in the middle of the block), and each name is guaranteed to be longer and just as irrelevant as the last one. Helping to add syllables is the fact that attached to each name is a suffix denoting the kind of roadway. For instance, Strasse or Straße is "street" and Weg is "lane" or "way". However, Allee is not "alley", but rather "boulevard" or "avenue"; gasse is "alley." There are others, but those are the usual suspects. Many of the largest German cities have multi-level intersections in their central areas. You'll often find that through traffic passes in a tunnel under major signalized intersections. In some of the busiest places, there may be extensive underground trafficways. Again, make sure you study a good city map before you start out. Congestion in German cities is no better or worse than other European and world cities. Rush hours are generally 7.00-9.00 and 16.00-18.00 on weekdays. In some of the trendy nightlife districts, you may find yourself staring at brake lights until well after 23.00. Popular shopping areas will usually be congested and parking particularly hard to come by on Saturdays. Definitely be on the watch for pedestrians. They always have the right-of-way in zebra-marked crosswalks, but oftentimes they'll dart-out between cars and other locations. In residential areas, be on the lookout for children playing near streets-- you're required by law to pass by them at the slowest speed possible. The same holds true if a handicapped or elderly person is in or near the street. Basically, driving in cities in Germany involves the same skill, patience, and sense of humor as driving in cities in the US and elsewhere. Use common sense and pay attention and you should do fine. In the wake of the Volkswagen diesel scandal in 2015 and with many German cities struggling to bring air pollution levels below EU limits, an environmental group won a lawsuit in 2018 to force the cities of Stuttgart and Düsseldorf to enact bans on diesel vehicles. Stuttgart, along with Hamburg, Berlin, and Frankfurt, have now approved bans on older diesel vehicles. To date, only Hamburg has implemented their ban and only on sections of two major roadways. The other cities are planning to implement their respective bans in 2019. More cities-- including Düsseldorf-- are likely to follow in the coming months and years. In Berlin, like Hamburg, the ban will apply to select roadways, while Stuttgart and Frankfurt are planning city-wide bans. All except Stuttgart only exempt vehicles meeting the latest EU standards (so-called "Euro 6") from the ban; Stuttgart is currently planning to allow "Euro 5" vehicles as well, at least initially. Your biggest problem may not be navigating cities, but finding someplace to (legally) stash your vehicle reasonably close to your destination. In most German cities, you'll have a good selection of parking facilities. 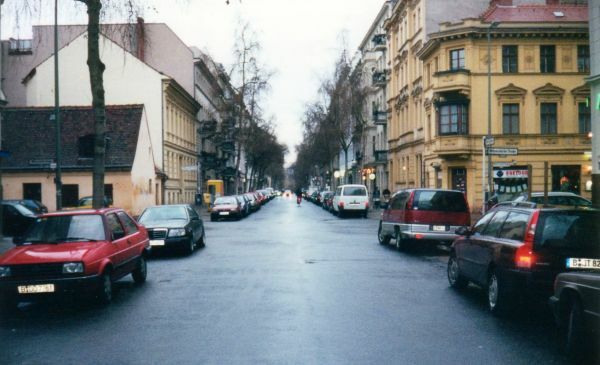 There is the ubiquitous on-street parking as well as off-street parking lots (Parkplatz), above-ground garages (Parkhaus), and underground garages (Tiefgarage). Most large cities have extensive parking facilities, and parking maps are usually available from the tourist information offices. Unfortunately, there are often not enough spaces to go around, and you may have to drive around a little while before you find a place, all the while feeling like the losing participant in a round of musical chairs. Still, except on the busiest days and during the peak times, you should be able to find a place within a reasonable amount of time. Costs for parking in Germany are a little on the pricey side. The "parking management area" sign marks the entrance to a neighborhood where parking allowed on all streets in the area (unless otherwise posted) with the use of a parking disc or voucher as indicated by a supplemental sign. This means that this requirement won't be posted on signs on each block. The "end of parking management area" sign marks the exit from such an area. 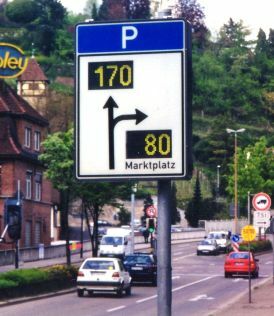 There are many more signs related to parking on the German traffic signs page (page 2) as well as additional vocabulary used on signs. Parking vouchers (Parkschein) ("pay & display"): The supplemental sign "mit Parkschein" requires you to purchase a parking voucher before leaving your vehicle. These are obtained from a nearby machine (Parkscheinautomat)-- look for tall signs marking the location of these, usually mid-block or sometimes on corners. The operation of these machines varies, but instructions (sometimes in English or with pictures) are clearly posted on the front. 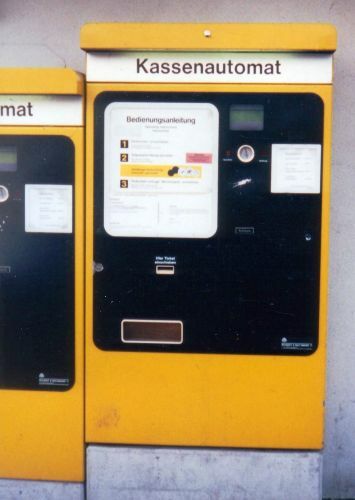 On some, you first locate the parking rates (Parkgebühr) on the front of the machine. Determine how much time you'll need, then deposit the corresponding amount. The display will indicate how many minutes or what expiration date the amount you've inserted will buy. When you're happy with the time shown, press the designated "finish" button (often green) and the machine will dispense a small ticket (voucher). On other machines, you start by pressing designated buttons to add time (often a "+" button) until you get to the time you want, then insert your payment. Once you've entered the amount due, the voucher will be dispensed. Note that most machines do not make change. Many machines now accept credit card payments and some now will even allow you to pay using your mobile phone either via an app or SMS message. Once you've paid and have your voucher, return to your vehicle and place the voucher on the dashboard where it may be easily read from the outside. You must then return to your vehicle before the expiration time shown on the voucher. If the nearest voucher machine is out of order, you should try to find another one close by; you will usually find another one across the street, at the other end of the block, or around the corner. If you cannot locate another machine, use a parking disc instead (see below); you can then stay up to the maximum length of time shown on the machine or signs. Many areas only require you to use a parking vouchers during certain times; check the signs or schedule on the machine. Oftentimes, the machines will shut off when parking vouchers are not required. 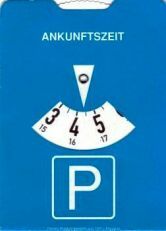 Parking discs (Parkscheibe): A parking disc is a blue cardboard or plastic card with an adjustable time dial. You can obtain these for free or nominal cost from many gas stations, newsstands, tobacco shops, and police stations. Rental cars should already have them (if yours doesn't, ask the rental agent for one.) Signs indicating that you must use a parking disc will also indicate the length of time you can park. Turn the dial so that the arrow points to the time of your arrival, rounded-up to the next half hour. For example, if you arrive at 10:40, set the disc for 11:00. Then place the disc on your dashboard. You must return to your vehicle within the indicated time period. So, for instance, if you arrived at 10:40 and the signs said that you could park for 2 hours with a parking disc, you would set your disc for 11:00 and you would have to return to your vehicle by 13:00 (1:00pm). As with many things in Germany, this mostly works on the honor system, but spot checks are conducted. Many areas only require you to use a parking disc during certain times; be sure to check the signs. Outside of those times, you can usually park as long as you want, but double-check for other signs showing some other restriction. Parking fines generally range from €5-25 and if you are obstructing traffic or a driveway, your vehicle will almost surely be towed, and quite quickly. In such an event, call the police to settle the situation. Besides indicating where parking is permitted on the street, the "parking" sign also gives directions to off-street parking facilities. Directions to garages are usually indicated by "parking garage" signs . In many larger cities and towns, there are electronic signs indicating which lots and garages are available (Frei) or full (Besetzt), or showing the number of available spaces. Parking facilities are often numbered to assist you in finding them (e.g. lot P1, garage P2, etc. ), especially in downtown areas, large shopping centers, and airports; these are typically marked with the "indexed parking facility" sign . Very few lots and garages allow you to park for free. The ones that do often require you to use a parking disc (see above). The rest require payment, and you'll be hard-pressed to find a lot or garage with an attendant. While some lots use parking vouchers (see above), most use an automated centralized self-pay system. When entering the parking lot/garage, you obtain a time-stamped ticket from the entry gate. Park your vehicle and take this ticket with you. When you are ready to leave, but before you actually return to your vehicle, find a parking payment machine (Kassenautomat). These are usually located near pedestrian entrances. Insert the ticket you received from the entry gate into the designated slot on the machine and the amount due will be displayed. Pay the amount shown and the machine will return your ticket or dispense a new one. If you also want a receipt, push the button marked "Quittung" immediately thereafter. Then, return to your vehicle and exit the lot/garage. At the exit gate, insert the ticket into the machine there and the barrier will open. You generally have 15 minutes or so to reach the exit gate from the time you pay. If for some reason you don't make it within this time period, go back to the payment machine and start the process again using the ticket that you received from the previous payment. Most lots and garages are open 24 hours; however, some are not open overnight. If you're going to be out late, make sure that the lot or garage you use will still be open when you return!